There are some routes, particularly on gritstone, that have legendary status and a special aura about them. The very name of some of these routes is enough to send shivers down your spine and the thought of ever being on the sharp end is incomprehensible. Two of the arguably most famous of these so called routes can be found at Black Rocks. Johnny Dawes 80's masterpiece Gaia, and Seb Grieves ground breaking line, Meshuga. Gaia stands proud on the west face, the line so pure and distinguishable running straight up one of the best blocks of grit around. Your eyes are instantly drawn to it the minute you come up the hill. Meshuga however lurks around on the dark side, barely seeing the light of day, guarded by the permanent shade that the front face of this classic crag casts. It is quite possibly one of the most intimidating lines you'll ever see. They are both iconic and are firmly cemented at the top of British climbing history. 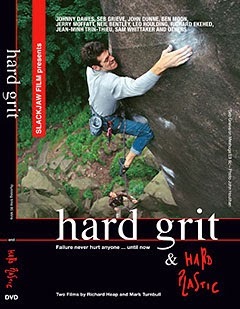 Both these routes shot to fame and became 'immortalised' in the film Hard Grit back in the 90's. I'm sure we can all relate to how it felt watching this movie for the first time. The horrifying sound of Jean-Minh Trin-Thieu smashing into the lower arete as he loses all control on Gaia, and then the classic running commentary as Seb attempts to calm the nerves on his ascent of Meshuga. Black Rocks is my home crag and where I first went climbing around 18 years ago. Gaia in particular is a route that I have always, for as long as I can remember, looked up at and dreamed of one day being able to climb. Virtually everybody within the climbing world has heard of this testpiece and it is a much sort after tick. I have to admit though, it would always scare the living daylights out of me, and I never imagined I was good enough to do it, let alone have the right mindset something like this requires. So it sort of got put on the back burner. Friends came along and did it and yet I still couldn't find the psyche needed to get stuck in. This season though my attitude towards these hard routes changed, to the point where I could not wait for the temperature to drop and grit season fully kick in. Thankfully it finally did a couple weeks ago and I felt more fired up for the coming season than I had been in a long while. Maybe it was due to knowing how much stronger I've been feeling from a summer of sport climbing, as well as realising I had a half decent amount of fitness in me. It has been a truly incredible start to the grit season already. Probably up there with one of the best anyone has ever heard of, and its only mid November! E9's and E8's have been falling down and tamed left, right and center. It has been pretty inspiring reading daily reports of peoples successes, and it does beg the question, what in the world has happened!?! I have my own thoughts but will leave them for now. About a week ago I took an opportunity to hit up Black Rocks and throw a rope down Gaia. It was unbelievably hot and sweaty with zero wind. We waited until the sun dropped a little lower and almost instantly things started to feel a million times better, and I managed to link the thing in one go. Time was starting to get the better of us though so we packed up and decided to leave it till later in the week. Wednesday came around and I'd arranged to meet up with Jon and Pete. There was a frost, the sun was out and it looked like being a perfect winters day. However I'd woken up with a grim cold, and sore throat but decided to head out anyway and see what happened. The moves felt fine, my sequenced was fully drilled into my mind, I knew what needed to be done and was 100% certain I'd be able to execute. It was hotting up a little though but luckily just as I was about to set off a cloud bank came over that made your fingers grip to the crystals of grit like glue. Clipping the gear I pulled onto the face and set up for the crux pull into the groove. It all went like clockwork, suddenly I was above the cams, this was it, now or never. I padded my way to the top of the groove and delicately reached out left to the sloping shelf, making sure to keep my mind from wandering astray and firmly on the prize. The next few tricky foot swaps went well until I was all set up for the final lunge. I chalked up, took a quick breath, ran my feet up the wall, kicked my toe out right and locked on up to the bomb proof arete hold with a massive sign of relief and unexplainable joy. A big big moment for me and my climbing career. The sense of relief and satisfaction it gave straddling that top arete is hard to describe and a moment I've often found myself trying to imagine how it would feel. It is so different to the feeling of clipping the belay of a hard sport climb. Probably because you've come out of an extremely dangerous situation and certain ground fall, alive and well! I'd had this idea a few days before of being able to climb both Gaia and Meshuga in the same day. The Americans did it a few years ago and it'd be a pretty cool achievement. In order to do so it was paramount I made sure all images of Jean-Minh and Mawson smashing into the ground were well out of my head. I was already half way there and already knew what to do on Meshuga from taking a look a couple weeks previous. Both Pete and Jon were keen so we packed up and headed around onto the front face. Conditions were minted, the rock was bone dry and I ended up top roping it at the first time of asking. It was more than possible. The route is totally my style all the way, with its compression slapping and big moves. I did it a few more times, gave the holds a good scrubbing and firmly went over the sequence in the my mind again. For some bizarre reason I still wasn't sure about it though. But I started to get prepared to go for the lead. I tied in, pulled on my shoes, and tightened up the helmet. I stood at the base of the route, hands chalked and placed on the starting holds. Then all of a sudden my state of mind seemed to change and various thoughts started to emerge. Climbing Gaia seemed like a lifetime ago and I didn't want to go for this one just for the sole purpose of being able to say I'd done both in a day. I knew I'd regret walking away, but I also equally knew I'd regret it even more if I screwed things up and got hurt. But the conditions were mind blowing, that perfect velcro like grip had arrived and everything was prepped! I took the decision to back down and promised to come back the day after. I wasn't prepared to risk, at any price, ruining the feeling of such a special day by getting greedy and potentially messing up. The next day my mind felt renewed and back in the game. The sun was out again but the wind was raging like a bull! Hardly ideal on something as serious as this, when a moment lapse in concentration could mean you shattering your bones on the boulders below... After warming up on the route again I took a walk around into the sunshine and sat and ate a chocolate flapjack I'd been saving as a celebration treat. My body felt like it needed a little comfort! All that was bothering me was the distraction of the wind. But then I just suddenly decided to go for it and before I had chance to changed my mind, ran back round to tie in. Everything went as planned, no hickups, although I admit to feeling a little more nervous than I usually do! Within seconds I was at the break and the welcome sight of a solid 0.5 cam. It was a strange feeling topping out on this one. Without the wind, I'm positive it would have made the whole experience so much more enjoyable but it didn't matter anymore. A route that even in my wildest dreams I'd never imagine being able to do, was suddenly done, over in a matter of seconds. Standing in the light of the setting sun, on top of the crag, just made it all the more special. I was left to reflect and gather my thoughts on what had truly been a whirlwind couple of days. Massive thanks go out to team Clark yet again, for all their support and patience standing in the cold for me. I am very grateful. Enjoy the videos and pics!